It’s no wonder that the Chairman continues to be a best seller, year after year. This Reflections flagship spa comes fully loaded with exclusive features such as the UltraLounge® with a programmable Dynamic Massage Sequencer, three patented NeckFlex Jet Systems®, two powerful massage jet pumps, magnificent jet massage action, and contoured, multi-level seating. Relax in this aquatic haven that seats up to six adults and accommodates people of varying heights. Equipped with two NeckFlex Jet Systems®, "His and Her" High-Performance Seats, and a SportsZone Seat®, the Nautilus is sure to loosen and relax the most worn out muscles. The Californian will seat up to 6 people with multilevel, barrier-free seating and a High-Performance Lounge. 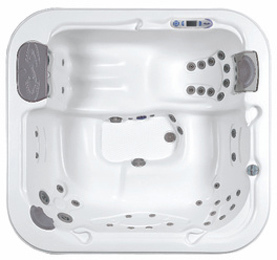 Brand new features found in this model include the optional Stereo and Liquid FX that add a unique audio-visual dimension to your hydrotherapy experience. With a High-Performance Lounge for her and a High-Performance Lounge for him, there will be no more fighting for the best seat in the hot tub! The Diplomat offers seating for five, including a SportZone seat® and a pair of patented NeckFlex Jet Pillows. 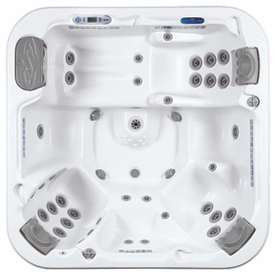 The Aurora is a sophisticated spa that will dazzle you! There's contoured seating all around, promoting proper body positioning, and the amazing UltraLounge®. Nautique’s incredibly pleasing aesthetic is matched only by it functional brilliance! It comfortably seats six and features roomy semi-contoured, barrier-free, multi-level seating. Best of all, it includes four factory-installed NeckFlex Jet Systems®, D1’s patented neck and shoulders massage system is not offered by any other hot tub maker! “Nautique” also features 45 bliss-inducing Accent Ring massage jets. The Seville offers an ultra-advanced High-Performance Lounge with the patented NeckFlex Jet Systems® and barrier-free seating for up to five people. 41 jets and a powerful massage jet pump make for an exceptional hydrotherapy experience. The Triad II is the perfect hot tub for those who demand high performance in a compact package. Immerse yourself in total head-to-toe therapy in the UltraLounge® featuring the patented NeckFlex Jet System®. Reminiscent of the original, barrel-style hot tubs, the Arena awakens a youthful nostalgia in all of us. Entertain up to seven guests in this classic barrier-free seating design, featuring ceramic tile accents, spacious foot well, and two authentic Typhoon jets.